I remember being around eight and my brother and I not able to wait for Christmas Day to arrive the excitement would just grow and then Christmas Day would come and go. Well as an parent I can wait, not because I don't enjoy Christmas and the feelings it brings, but because there is so much to do and get ready. Decorations, cards (I never get them out in time), presents, parties, year end projects at work, and day-to-day craziness. Among all of this I want to make Christmas something more than anticipation and one special day for my daughter. This month provides many opportunities to create many special days and create and carry-on traditions that your children will cherish. Rockefeller Center Christmas Tree Location: Rockefeller Center is located in the center of the complex of buildings between 47th and 50th Streets and 5th and 7th Avenues. See Rockefeller Center Map. The Rockefeller Center Christmas Tree is typically illuminated from 5:30 a.m. until 11:30 p.m. daily, except on Christmas and New Year's Eve. On Christmas, the tree is illuminated for 24 hours and on New Year's Eve the lights are turned off at 9:00 p.m.
Festivities will include hot chocolate, music, hot pretzels, candy canes, lighting of the Borough tree and a visit from Santa! 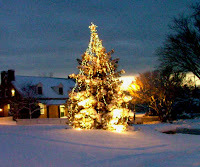 Montclair's tree gets lit on Friday, Dec. 5th, 6 p.m. at Church Street. Santa will be on hand, too, to usher in the season and pose for pictures . Join us for Santa's arrival by fire truck, tree lighting, and caroling by the Immaculate Heart Academy choir. Enjoy the complimentary hot cocoa and refreshments while we spread the holiday cheer. Activities are held in the courtyard by Talbots. Santa will return to East Rutherford on December 21st for one last visit before the big day! Be sure to look for Santa as he makes his way through Borough streets along with his friends from the East Rutherford Fire Department. A powerful story of redemption, Charles Dickens’ “A Christmas Carol” has enchanted audiences the world over with its simple message of selfless giving. Ebenezer Scrooge, survives a merciless battery of revelations through visits by the ghosts of his own Christmas: Past, Present and Future. Performed by TheatreworksUSA. I am a Dad who writes a blog called kidzense which provides tips, activities, and information for parents raising kids; a computer programmer working in eCommerce, a MTB racer and rider that writes rideyourbike.us which provides stories about rides, training tips, and trail and equipment reviews.